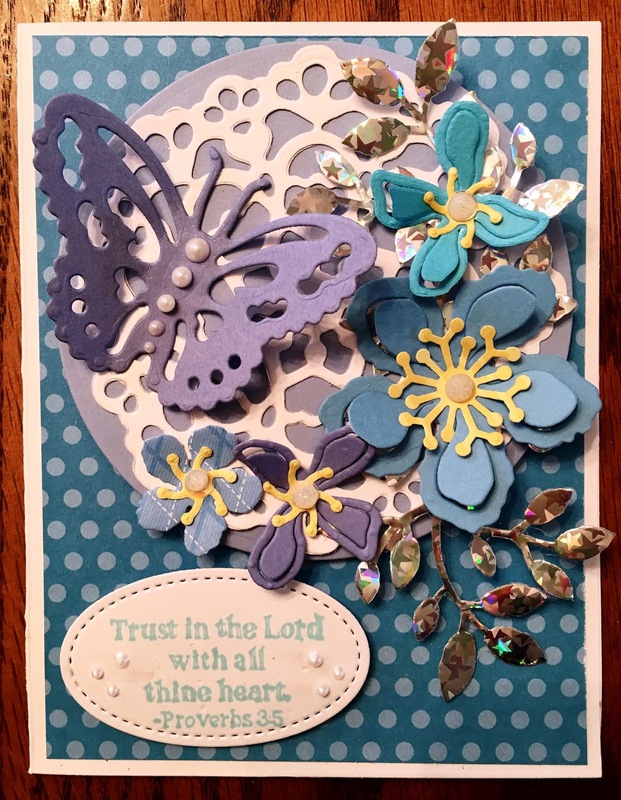 Have you ever set out to make a card and made flowers and embellishments, only to find out through the middle of the process, that what you have made doesn't really work with the current project? Well, I have many times; and so I lay those pieces aside in hopes that somewhere down the road there will be a good use for them. Sometimes they lay unused for months. Today's card is made from former castaways that didn't fit together for what they were made. So I gathered some that had colors that went together and made something from them. The flowers are from SU Botanical Thinlets; the doily is from Memory Keepers Antique Doily; the foliage is from Spellbinders Sprigs; circle is Spellbinders Standard Circles. I don't remember the die used for the butterfly. It's been lying around for a long time. Sentiment is from a discontinued SU stamp. Liquid pearls adorn the flowers and the butterfly. Yes, I have done that many many times! Too many to count! :) You did a beautiful job of putting different pieces together from "yesterday". Gorgeous! Thank you so much for entering our challenge at Crafty Gals Corner Challenges this week. Be sure to join us next week too! Wow! Super pretty! Thank you for joining our “Anything Goes” Challenge this week at Die Cuttin’ Divas. Great work! Thanks for joining us at Crafty Friends. Excellent use of your "leftovers"!Thank you for sharing with us at the Crafty Gals Corner this week!Hope you join us again soon! Wow! So pretty! Thanks for joining us at Die Cuttin Divas this week! Isn't it a great feeling when you create something using just those elements that you have put to one side for later? Shame I rarely ever do this - I really need to lol. Wonderful used of die-cut elements. We're so blessed that you joined us with your wonderful art last Challenge. We would like to invite you to link with us again in our current Challenge at Word Art Wednesday. Leaving some inspiration from the Word of God in John 6:35, "Then Jesus declared, “I am the bread of life. Whoever comes to me will never go hungry, and whoever believes in me will never be thirsty. "...Have a wonderful and blessed week. Wonderful card:) i like your good idea ,Thanks for the inspiration!